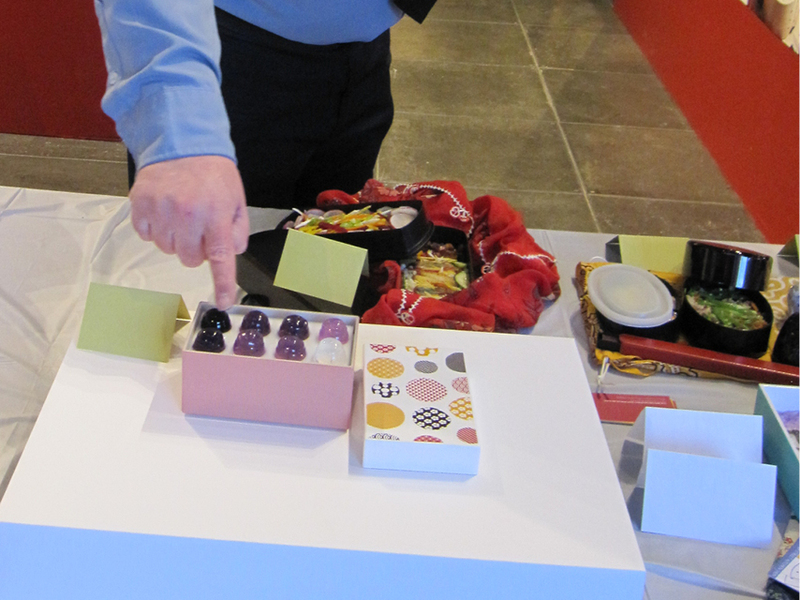 I’m a designer, and not a chef, so I knew right away that I wanted my contribution this event to be about physical interaction. Something enticing, surprising, maybe a little creepy, maybe silly. 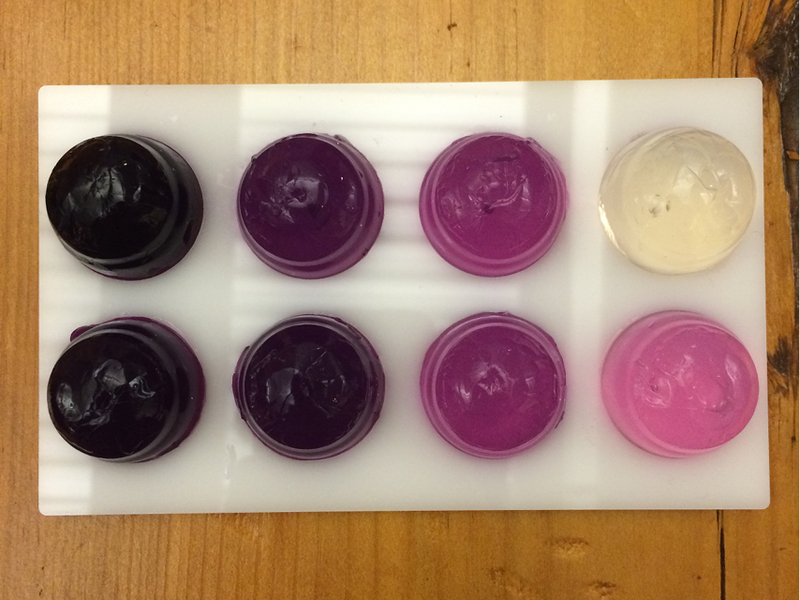 I was inspired by Raphaël Pluvinage and Marianne Cauvard’s wonderful 2012 Noisy Jelly project. 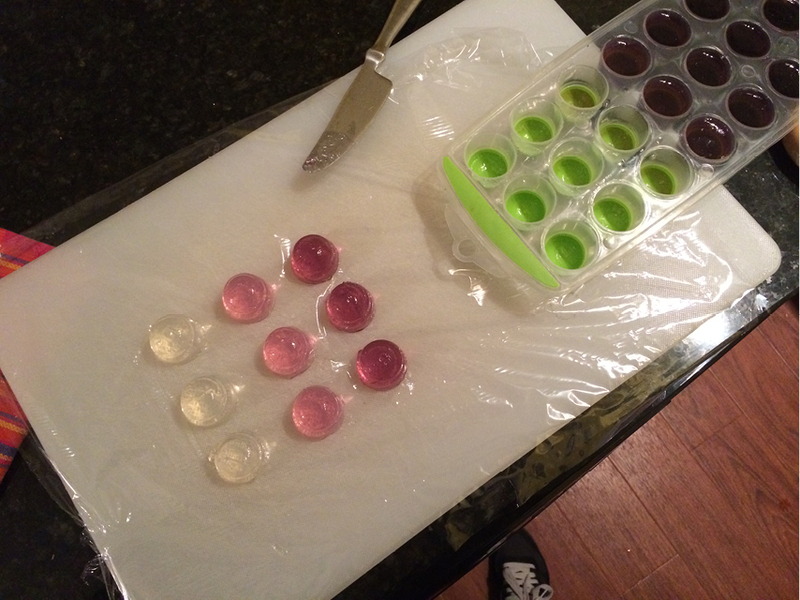 Creating a gradient effect in Jello is easy: Mix unflavored gelatin with water like the package says, divide the liquid, and mix in progressively larger amounts of food coloring. 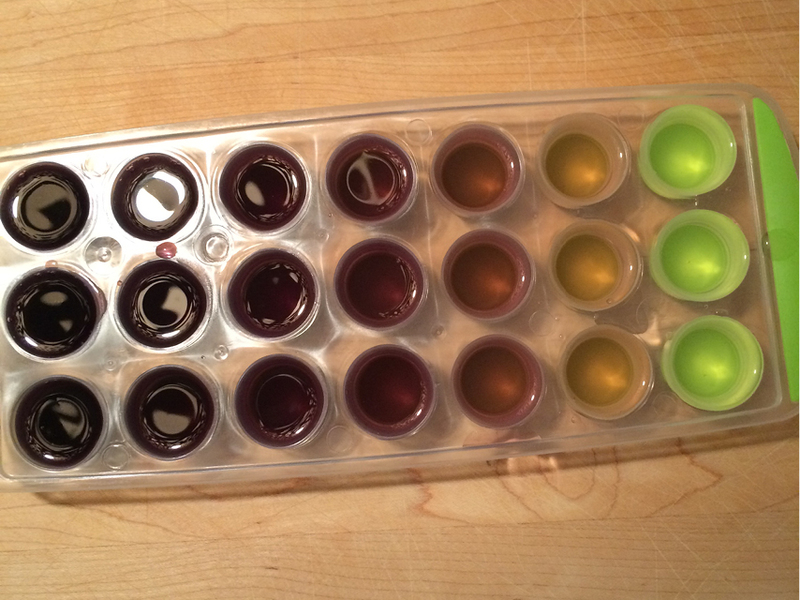 Pour the resulting mutli-colored liquid Jello into your mold (in this case, a fancy ice tray). 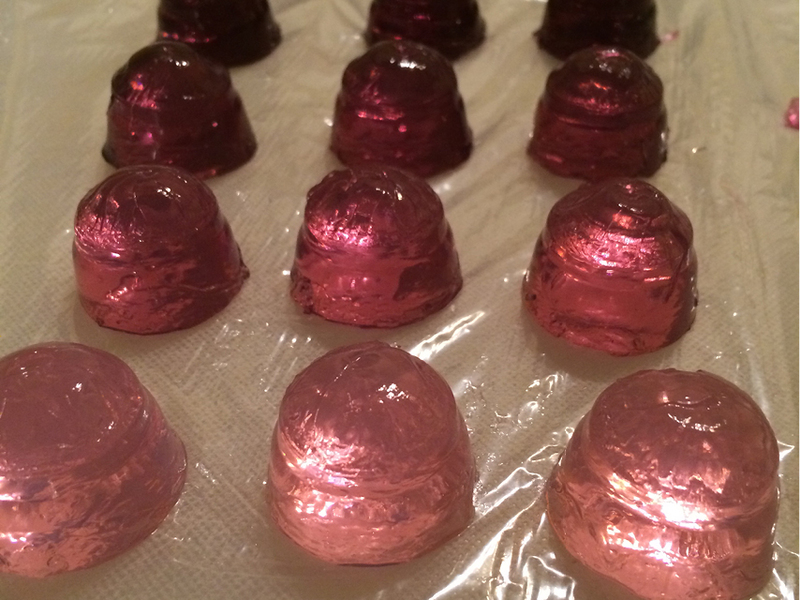 Getting the Jello out of the mold proved challenging, until I looked up what every 60’s housewife knew: run the Jello mold under hot water for a few seconds, and your shape will come out beautifully. 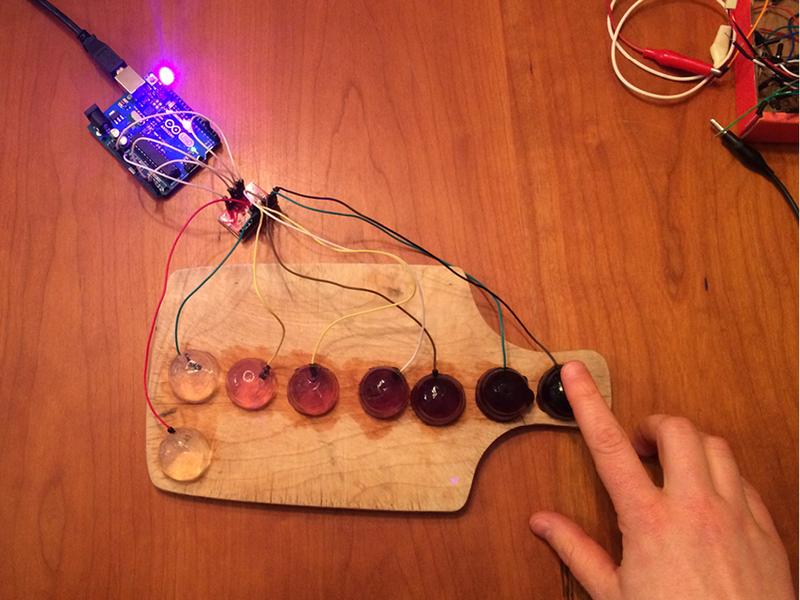 Here’s the setup: An Arduino microprocessor is connected to a capacitance sensor that measures distance between conductive objects (a finger and a Jello, for example). 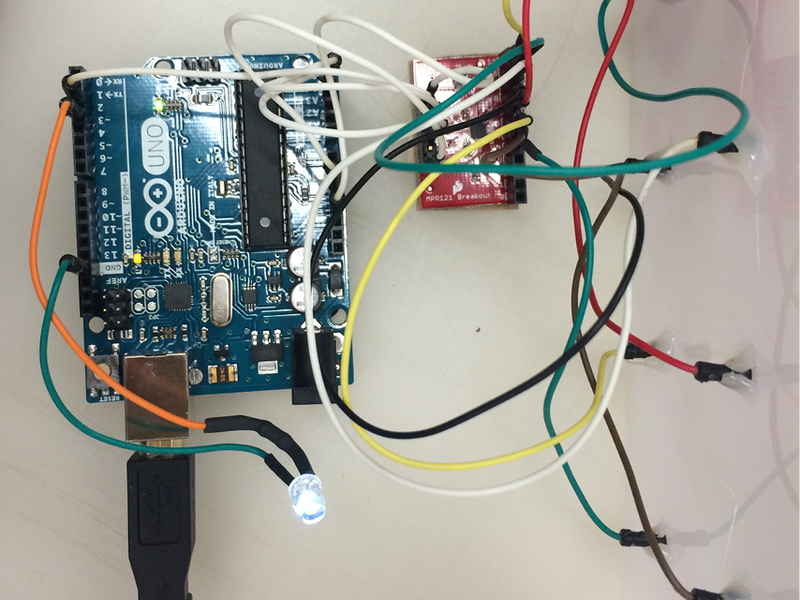 The Arduino collects the sensor’s data feed, and triggers a light when one of the leads is touched. The capacitance sensor I’m using here is Sparkfun’s MPR121 Capacitive Touch Sensor Breakout. Although I didn’t need all of them for this project, the MPR121 can measure up to 12 different touch inputs. 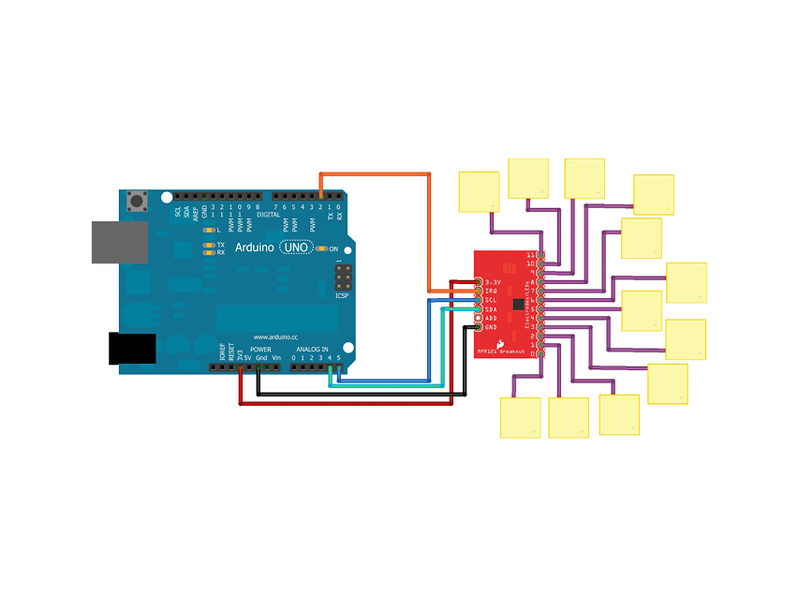 I connected the breakout to the Arduino, and attached 8 leads—one for each Jello node. Eureka! When I touch each Jello the LED comes on and the Arduino sends a serial signal to a Processing sketch running off my laptop, triggering sounds that will loop until the Jello is no longer being touched. My wife is a singer, and we’ve collaborated on several other sound projects based on the human voice. For this one I asked her to just imagine what “sound” Jello might make and then record each note of an eight-note scale in that style. 9. The Matrix. The Plastic Matrix. 10. Rice? No, Thanks. Electronics. 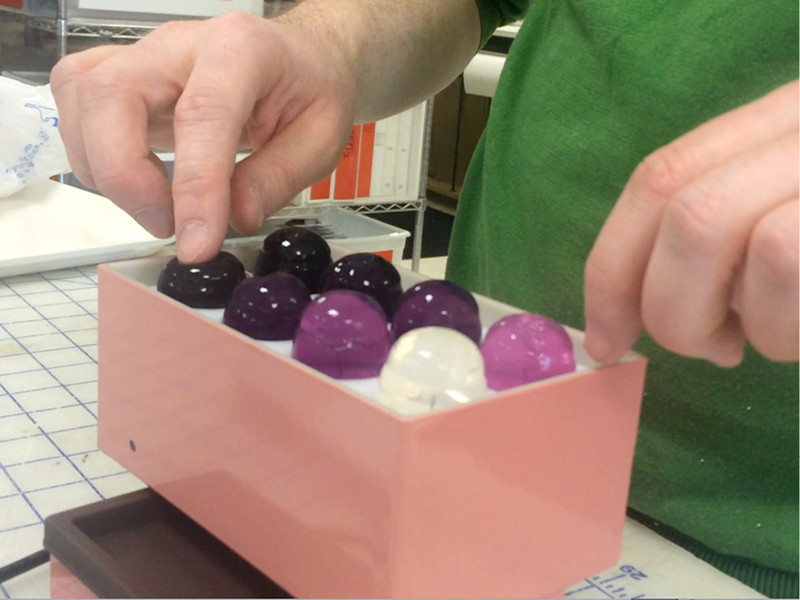 All the electronics fit perfectly into the bottom compartment of the bento box (the space traditionally used for storing rice). The Model Shop made a foam core platform to hide the laptop. 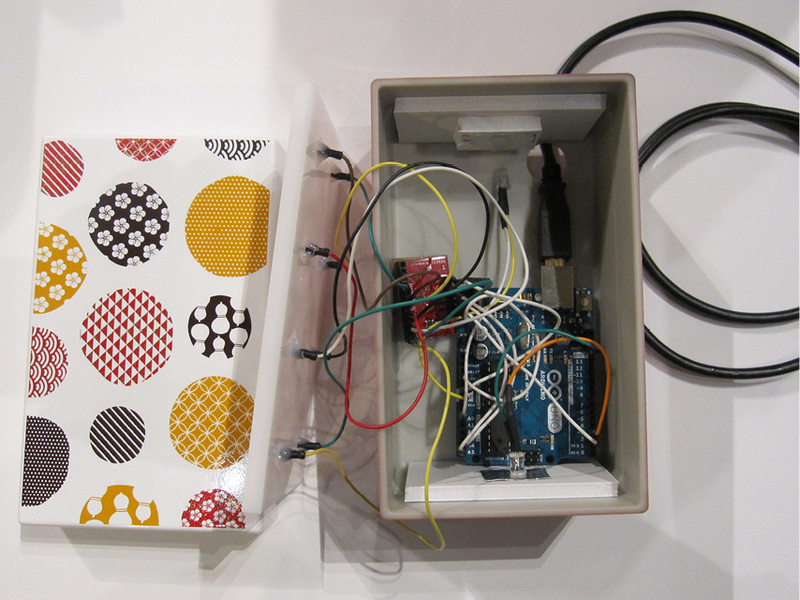 We ran the Arduino’s USB cord down through a hole in the bottom of the bento box. 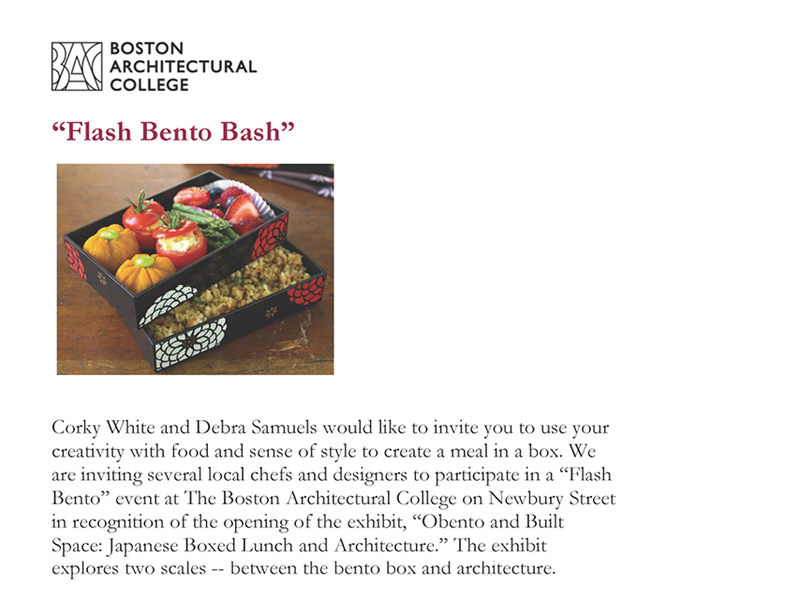 The final piece was installed in Boston Architectural College’s McCormick Gallery, amid other bentos created by local chefs and food experts.